The common names of these wires are: K Line and L Line, usually the L line (if presents ) will work only for starting communication (initializing the communication) between ECU and the scan tool, while K line is used for messaging among ECUs and the scan tool. Line K is always available, it is a bi-directional line. When L Line is not available, The K Line is used during initialization to transmit the wake up pattern from the diagnostic scanner to vehicle ECUs. 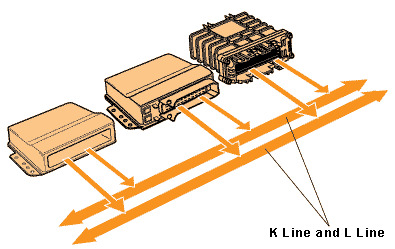 After conveying this information, the K line is used for all other diagnostic communications between the scan tool and vehicle ECUs, in both directions, that is, same line will send and receive information. During our developments in Autohex scan tool in the last 5 years we noted that the slow initialization is used very rarely in the newer vehicles, while VW/Audi is still committed (until 2006) with the slow Initialization. Option2: The Diagnostic scan tool will be isolated from the ECUs bus and a gateway will transport all requests and responds to the diagnostic tester. Keyword Protocol 2000 could be a bus which means, all ecus are shared in one wire (the K Line), also in this case the diagnostic tester will be as a part of this network. The K-Line is used for communication and initialization. Special cases are node-to-node connections, that is there only one ECU on the line, which also can be a bus converter. BMW, VW, Toyota, Nissan, Peugeot, Citroen, and all others, they use the one bus concept for all ECUs. In this article will describe here just the main services of this protocol. These services which are a must for maintain the communication based on KWP2000 specifications. We noted that most of the vehicles manufacturers and Ecu suppliers they don’t comply to the standards of KWP2000, for example, Toyota uses a baud rate of 9600 rather than 10400, and the start communication paten differs from the standards. Upon receiving a initialize indication primitive, the ECU shall check if the Requested communication link can be initialized under the present conditions. Then the ECU shall perform all actions necessary to initialize the communication link and send a Start Communication response primitive with the Positive Response parameters, If the communication link cannot be initialized by any reason, the ECU shall maintain its normal operation, and may send the negative response. Upon receiving a Stop Communication indication primitive from the diagnostic scanner, the ECU shall check if the current conditions allow terminating this communication. In this case the Ecu shall perform all actions necessary to terminate this communication and stops the diagnose session.